The crackdown on freedom of expression under Egyptian President Abdelfattah al-Sisi has reached alarming new levels unparalleled in Egypt’s recent history, Amnesty International said today as it launched a campaign calling for the unconditional and immediate release of all those who have been detained solely for peacefully expressing their views. 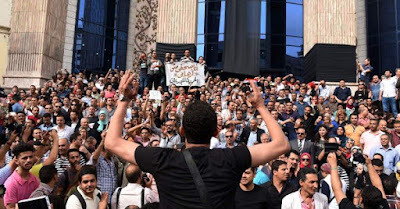 The campaign, “Egypt, an Open-Air Prison for Critics”, is being launched in response to the unprecedented severity of the crackdown in Egypt, as people around the country increasingly express discontent with the economic and political situation. Amnesty International invites supporters from around the world to show solidarity with those risking their freedom to express their views by writing to the Egyptian government and calling for an end to the persecution. said Najia Bounaim, Amnesty International’s North Africa Campaigns Director. Since December 2017 Amnesty International has documented cases of at least 111 individuals who have been detained by the National Security Services solely for criticizing the President and the human rights situation in Egypt. Hundreds of Egyptian political activists, journalists, human rights defenders, members of the opposition, artists and football fans are currently in jail for daring to speak up. The reasons for their arrests range from social media activity to having a history of activism. At least 35 individuals have been detained on charges of “unauthorized protest” and “joining a terrorist group” because they stood together in solidarity in a small peaceful protest against increased metro fares. Comics and satirists are among those who have been targeted, including at least two individuals who posted satirical commentary online and were arrested by the police under the pretext of “violating public decency” or other vaguely defined offenses. The Egyptian authorities have recently passed new legislation that enables mass censorship of independent news platforms and pages belonging to human rights groups. Since April 2017, security agencies have blocked at least 504 websites without judicial authorization or oversight. The laws were adopted by the country’s parliament without any consultation with civil society or journalists, mainly under the pretext of “anti-terrorism” measures. “President al-Sisi’s administration is punishing peaceful opposition and political activists with spurious counter-terrorism legislation and other vague laws that define any dissent as a criminal act,” said Najia Bounaim. Amnesty International is calling on the Egyptian authorities to release all detainees who are in prison solely for peacefully expressing their opinions, end their repressive campaign of media censorship and abolish legislation that tightens the state’s stranglehold on freedom of expression in the country. The Egyptian authorities’ relentless and unjustified measures to mute peaceful voices have pushed hundreds of activists and members of the opposition to leave the country to avoid being arbitrarily arrested. However Amnesty International has also highlighted the bravery of Egyptians who continue to speak up against injustice. “Despite these unprecedented challenges to freedom of expression, and despite the fear which has become a part of daily life, many Egyptians continue to peacefully challenge these restrictions, risking their freedom in the process,” said Najia Bounaim. Amnesty International is calling on supporters to sign its petition and write to the Egyptian authorities, calling on them to immediately and unconditionally release all those detained solely for peacefully expressing their opinions. Srinagar: Jama’at-e-Islami Jammu and Kashmir strongly denounces the plan of shifting of thirteen inmates lodged in the district jail, Kehribal Mattan Islamabad to the jails outside the valley and calls it an unwarranted action based on political bias and vengeance having no legal and moral justification. All these inmates are political detainees and are being shifting to outside jails for subjecting to suppression and physical and mental torture which is a blatant violation of the basic rights of prisoners under the international law to which India is also a signatory. These inmates were boarded in a police bus during the daytime but on strong protests from their close relatives they were again taken inside the Mattan jail to avoid the protest and during the night hours, they are likely to be shifted as scheduled. Among those who apprehend shifting is one Peer Mohammad Ashraf of Batagund Verinag now languishing in the jails for more than fourteen years and has no legal trial pending against him and one Abrar Ahmad from Chowgam Qazigund district Kulgam who is suffering from a fatal disease and needs homely care and proper medical treatment which he is sure to be deprived of in an outside jail. In the jails outside the valley these Kashmiri political detainees are subjected to inhuman treatment by the jail authorities being mostly from the police department having neither any knowledge of the rights of the prisoners and detainees nor trained therefor. These officers are trained in handling the law and order situation but deputed in jails to deal a situation quite strange to them with the result these jails have virtually turned into the interrogation centers and police lock ups losing their basic concept of the correction centers. These officers maltreat and misbehave with these jail inmates thereby violating all jail rules and regulations written in the jail manuals and the local and international laws relating thereto. Jama’at-e-Islami Jammu and Kashmir while vehemently condemning the shifting of political prisoners and detainees to the jails outside the valley, appeals the International and local human rights institutions to take cognizance of these inhuman methods to suppress the jail inmates in this unfortunate part of the globe and take concrete steps to safeguard their rights guaranteed to them under the international conventions and local laws. Jama’at impresses upon the jail authorities to desist from intimidating these innocent detainees and provide them all facilities available to them under the jail manuals. Jama’at also demands unconditional release of all these political detainees and shifting of all those detained in the jails outside the valley including the Tihar jail, Delhi to the jails in the valley, particularly the DeM chief Asia Andrabi, her two colleagues Nahida Nasreen and Fahmeeda Sofi, Shabir Ahmad Shah, Muzaffar Ahmad Dar , Altaf Ahmad Shah, Peer Saifullah, Naeem Khan, Meraj-ud-Din Kalwal, Ayaz Akbar, Syed Javed Ahmad and his younger brother Shahid Yousuf , Adv. Shahid ul Islam and Zahoor Watali. PULWAMA: Authorities have booked a pellet victim under draconian Public Safety Act here in South Kashmir's Pulwama district. 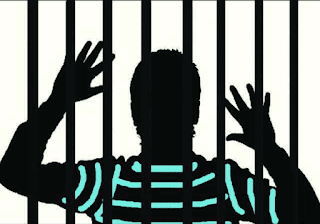 Suhail Ahmed Trambo son of Muhammad Ashan, a resident of Muran Pulwama was arrested by Government Forces along with many youth some two weeks before and today he was booked under PSA and shifted to Kathua jail. Suhail according to sources is the brother of 3 sisters and lone bread earner of his family. In 2017, he sustained pellet injuries in his left eye and lost vision. Family appealed authorities to release him. "We can't afford to meet him in Kathua jail. He should be at least lodged at Srinagar Central Jail. He is blind by one eye and not a stone pelter anymore,"